He has lived in Chicago where his music studio is located since 1986. In 1988, he participated in a summer course in Computer Music at the University of Chicago. In 1990-91, he studied the Suzuki Method for Piano atthe Chicago Music Institute under Yasuko Joichi. In 1999, he participated in a Carnegie Hall Professional Training Workshop (The Ellen Taaffe Zwilich Young Composers Workshop). 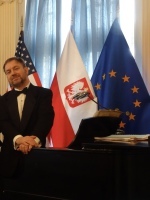 In 2013 he received his Doctor of Musical Arts degree from Fryderyk Chopin University of Music in Warsawunder the guidance of Prof. Pawel Lukaszewski.